Fact or Fiction? An apple a day can keep the doctor away! 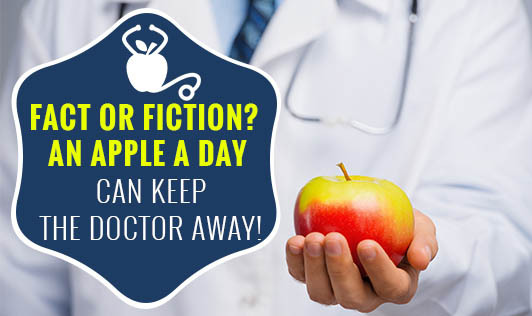 An Apple a Day Can Keep the Doctor Away-True or False? One of the most known expressions around: "An apple a day keeps the doctor away". Besides the fact that it actually rhymes, does it really have some value? We are living in an urban society where unhealthy diet has now become one of the contributing factors to the development of cancer and heart disease. Research suggests that a healthy diet, rich in fruits and vegetables could reduce the incidence of breast cancer, heart disease, and other ailments such as diabetes, Alzheimer`s disease, asthma and cataract. The useful effects of vegetables and fruits have been attributed to phytochemicals. Phytochemicals are non-nutrient components of food which include the phenolic acids, flavonoids, insoflavoids and carotenoids. • Pectin: This is a form of soluble fibre that lowers the glucose and blood pressure levels. Also, reduces LDL, or the bad cholesterol in the body. Pectin therefore helps in maintaining the health of the digestive system. • Quercetin: This is a flavonoid, a nutrient which is shown to reduce the risk of various cancers, including cancers in the breast and lung. It may also reduce free radical damage, which is related to a variety of age related health problems such as Alzheimer`s disease. •Vitamin C: Vitamin C boosts immunity, which helps maintain overall health. •Boron: Apples provide a nutrient called boron which can promote bone strength and brain health. •Phytonutrients: Apples are rich in a variety of Phytonutrients, including vitamin A, E and beta carotene. These fight damage from free radicals and can have a profound effect on health, reducing the risk of diabetes, asthma, and heart disease. Apples are low in calories, which is one of the trademarks of a healthy food that aids in weight loss. They also act as a toothbrush, killing the bacteria in the mouth and cleaning teeth which may reduce the risk of tooth decay.